Visual Learner? 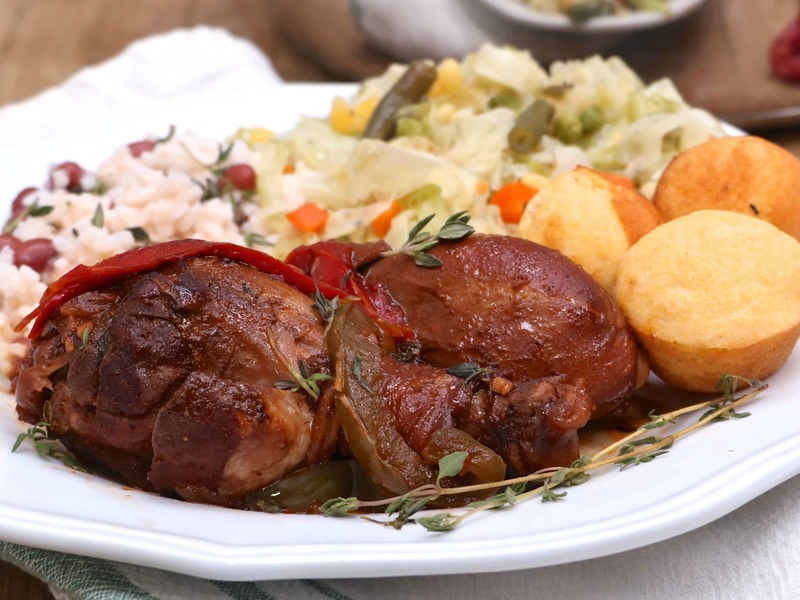 Watch me make this Jamaican Brown Stew Chicken from start to finish! Welcome to the very first village recipe!! I’ve been teasing about village recipes for over a year now and the very first one is here!! Wondering what the heck is a village recipe? You can find out (and join in on the fun) about village recipes here. 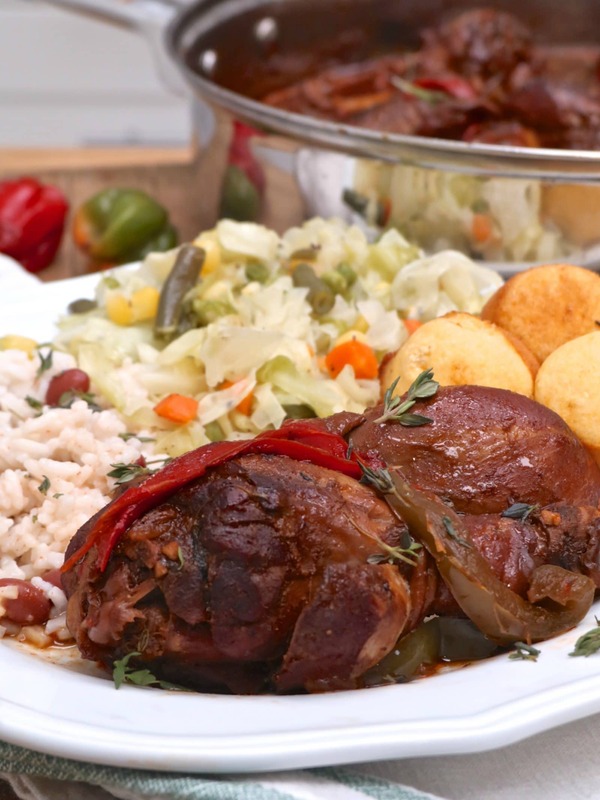 Today it’s all about this BOMB Jamaican Brown Stew Chicken!!! Anytime I go to a Jamaican restaurant I always get either jerk chicken or brown stew chicken. However, I’ve only tasted a few brown stew chicken dishes that were actually full of layers of bold flavor. I’m talking about the kind where you can taste the smokiness from the browning sauce, the lingering heat from the scotch bonnet pepper, and essence of that fresh thyme. Ahhhhh, amazing. If you follow me on Instagram, then you know I’ve been playing around with this recipe for a while now. I’ve used tips and tricks from “the village” aka you guys and this is by far my favorite brown stew chicken I’ve ever tasted! I’m not just saying that to flatter you guys either! Make Your Own Browning Sauce, Like For Real! To start this recipe we’ll be making a homemade browning sauce aka burnt sugar. I LOVE the idea of using coconut palm sugar (thanks for this Charla) for this recipe. You can certainly use brown sugar, which is what I usually use whenever I’m making Southern dishes that require a browning sauce. The coconut palm sugar just made so much freakin sense with this recipe though. Yes, you can cheat and buy browning sauce if you don’t feel like smoking up your kitchen (because man it gets smokey) but promise me you’ll only get one with all-natural ingredients. Most store-bought kinds can taste really weird and chemically. I’ve heard several times that I MUST rinse the chicken in water and fresh lime juice before starting because that’s what happens in most Jamaican households. I usually rinse my chicken in salt water so using fresh lime was nice and the chicken seemed to enjoy their spa bath. They looked clean and smelled so fresh afterwards lol. I think I’ll start using fresh lime from now on. This step is super important because it adds so much flavor to the chicken. Season it well!! You don’t have to go with my blend listed. You can use your favorite smokey all-purpose seasoning. I went with brown sugar, smoked salt, smoked paprika, garlic powder, onion powder, and black pepper. Nothing too fancy yet delicious! I halved my vegetables and added half of them to the seasoned chicken along with a few sprigs of fresh thyme. Refrigerate overnight. I do 24 hours if I have time. Searing the chicken creates a nice crispiness to the skin. 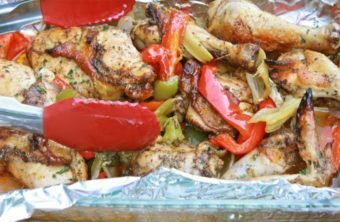 This avoids the skins having that rubbering texture that stew chicken seems to always get. You could also just remove the skins but I really like them! 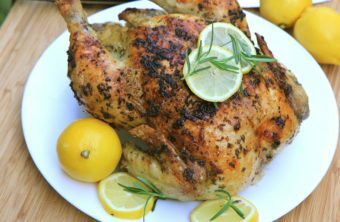 Don’t cook the chicken when browning it though! Just get that pan crazy hot and quickly brown the skins. I accidentally burned the skins on a few pieces of chicken and found that I really liked the texture, once stewed! Ha! Whodathunkit! The final part is creating that rich, flavorful sauce! We’re gonna do that by sauteing the remaining fresh veggies (not the ones in the marinade). Chicken stock replaces the water, and ketchup, more browning, fresh herbs, and the other half of scotch bonnet pepper simmers to create a fresh, bold sauce. The key here is to play it up to your taste buds once you have the basic recipe down. From all of my test recipes, I discovered that I didn’t really like having a thick, gravy-like sauce. I chose not to thicken the sauce since I liked the thickness it had simply from simmering away with those peppers but you can certainly cook in some flour, cornstarch or even breadcrumbs to get the sauce to your desired thickness. Totally a personal preference here! After your chicken has simmered away in that delicious sauce it’s probably falling-off-the-bone tender. Use more salt (you HAVE to add salt to bring out all the flavors of the sauce! ), garlic powder and a pinch of ginger to awaken all of those fresh ingredients we used. Add more fresh herbs as a garnish if desired. I served this brown stew chicken with cabbage w/mixed vegetables, coconut rice & beans (rice and peas) and mini cornbread muffins. Oh and a glass of Southern sweet tea on the side ha! Hey, you can take a girl from the south but you can’t take the South from the girl! As with any traditional dish, you will ALWAYS have different variations. I mean here in the South, everyone claims to have the best and authentic fried chicken recipe and buttermilk biscuits. 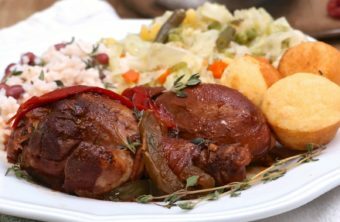 After viewing so many comments about Jamaican Brown Stew Chicken I can see that same passion is alive and well with this dish and I LOVE IT! Some folks say use ketchup, others say don’t! Some folks say thicken the gravy, some folks say never! Some folks say to use only scotch bonnet and pimento peppers, some say use a variety of bell peppers! Ha! I can already tell I’m going to enjoy the village recipe series!! Thank you all so much for helping me create our very first village recipe! It’s a hit! I’ll be announcing the next village on the village recipe page!